This cosmopolitan city is one of Spain&apos;s most important economic, cultural and commercial hubs, attracting both leisure and business tourism from all over the globe. Barcelona seems to find its way onto most people&apos;s itineraries and for good reason. It combines everything that is most charming about Mediterranean cities, a relaxed pace, months of endless sunshine, unbeatable food, with the cultural and design clout of almost any city in the cold north. It has a vibrant food scene, a plethora of unique historic architecture, great Mediterranean weather, beautiful beaches, and arguably the best nightlife in Europe. Basque-style tapas bars, Galician seafood taverns, avant-garde Japanese restaurants and sinful chocolate shops are all essential parts of the culinary landscape in Barcelona. Across the city, the architecture is colorful, playful, and unique and with a long history of hosting some of the most avant-garde artists in Europe, from Salvador Dali to Pablo Picasso, it&apos;s no surprise the arts scene in Barcelona is so alive. 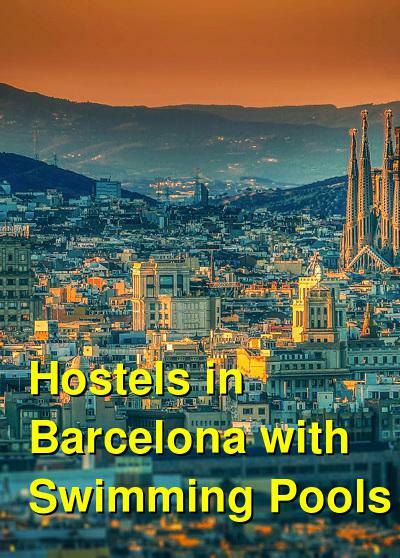 How much do hostels in Barcelona cost? Which hostels in Barcelona have pools? TOC Barcelona is a unique hostel with a fabulous interior design that will make your stay comfortable and unforgettable. Whether you want a private room or just a comfortable bed in one of their shared dorms you will find the perfect accommodation for your budget. Relax, make friends in their awesome and popular terrace with a cosy swimming pool and enjoy Barcelona&apos;s sunny days! You will find the most advanced technology in security, with fingertip keys, 24 hours reception, security cameras and other facilities such as a free wifi access, bar, kitchen, communal lounge, games zone and much more. Toc Hostel has a wide range of room types, from private ensuite rooms for 2, 4, 6 and 8 in case you come alone, as a couple, with family or friends to shared dorms, mixed and female only. If you like to meet new people from around the world and you are a social traveler you can choose the 8 beds and 6 beds dorms, with comfortable bunk beds and big lockers to store your luggage. Quadruple superior suites with private terraces are also available. Last but not least, if you are travelling with your special one and you are looking for a romantic trip, Toc Hostel can offer you a double room with fabulous views of the city and special features. Urbany Hostel is located in the center of the city in the former headquarters of the Architects Association of Barcelona during the past century. They have reinvented this historic building to suit all the needs of the new generation of travelers, offering both shared and private accommodations. Choose from single, double, triple or quadruple private rooms, mixed dorms of 4, 6, 8 and 10 people or female dorms for 6. The ‘Basic 8 Bed Mixed Ensuite’ or Joker bed is a mixed dormitory room type where guests can be accommodated in any of the room types available. This room type is used to fill available beds in the dorms and offer a special price for those guests who don’t mind to change their room during their stay. Urbany Hostel offers safe, clean and central accommodation where every single detail has been designed to satisfy different guests needs. From a large dorm for budget minded backpackers to the Pink Rooms with some exclusive extras only for ladies, all the rooms come with comfy beds, private bathroom, A/C, heating and under bed lockers. Lockers are lighted up with a led system to see your belongings at night and have 2 power outlets to charge your electronics. Every single bed has a reading table and reading light, USB charger, 2 power outlets and the larger dorms are provided with curtains for more privacy. Fresh, clean and individually packed bed linen is included in the price and the hostel provides a towel rental service and laundry facilities for a small extra fee. There is also an all-you-can-eat continental breakfast buffet available for 4€. You don’t need to reserve breakfast, just come around to the reception in the morning if you’re hungry. As always you’ll find free WiFi signal in the whole building, free computers available for your convenience, 24 hours reception with local and multilingual staff willing to help you, maximum security with video surveillance and keycard access for the front door, every floor, room doors and in-room lockers. The staff organizes many fun activities both in Barcelona and at the Urbany Bar where you will find cheap drinks and food. Alternatively you can also use the property&apos;s fully equipped kitchen. Located in Barcelona’s Gracia Neighborhood, a 6 minutes walk from Verdaguer Metro Station, BCN Sport Hostels offers a terrace-solarium with a swimming pool, air-conditioned accommodation with heating and free Wi-Fi. The BCN Sport Hostels has a collaboration agreement which allows to use a wide variety of sports facilities at a small extra fee. 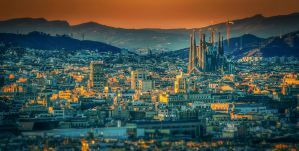 The hostel is a few minutes away from the most important symbols of Barcelona including La Pedrera, La Sagrada Familia, Park Guell, Placa de Catalunya, Cathedral, and much more. Barcelona&apos;s beaches are ten minutes away by metro. The hostel is conveniently located near Verdaguer and Diagonal metro stations. BCN Sport Hostel offers accommodation with spacious lockers, individual outlets, reading lights, air conditioning, heating, and free WiFi. The property offers female and mixed dormitories with bunk beds for 4 to 12 people. Extra-large beds and private ensuite rooms for 2, 4 and 6 guests are also available. Bathrooms are very large with showers, toilets, and sinks that are separated so individuals have easy access. Linens are included and towels are available for rent or purchase at reception. Guests have access to a small kitchenette with a microwave, refrigerator, and freezer. There is also a bar and vending machines at the property. If you want to enjoy Barcelona but escape the hustle and bustle of the city then InOut is the place for you. Located just 300 meters from the underground that connects the hostel with the city center, InOut is only 20 minutes away from Plaza Cataluna and Las Ramblas. Their rates include a free breakfast buffet, with a choice of cereals, selection of breads and pastries, fresh fruits, juices, tea and coffee. InOut hostel is located in the heart of the Collserola Park with 5 hectares of gardens and sports fields, perfect to enjoy the fresh air during Barcelona&apos;s sunny days. Sit back, relax and enjoy their terraces, sport area, and during the summer months you can stay cool in their outdoor pool. With its large living rooms, library, TV, games room, and meeting rooms, the hostel is perfectly equipped to deal with groups as well as individual travelers. Each guest can enjoy free internet access, free WiFi and the bar opened 24 hrs. The mixed dorms have ten to fourteen individual beds, separated by a partition wall to create modules of 2 and 4 beds, to achieve a more private and intimate ambiance. The smaller rooms have four beds, in modules of 2. Private rooms ensuite or with shared bathrooms are also available. Each individual bed offers an individual reading light, first class spring mattress, electrical socket and a generous wardrobe at the foot of the bed, with secure key. Rooms and bathrooms are cleaned daily. By choosing to stay at InOut Hostel Barcelona you are supporting a very worthy cause. The non-profit organisation employs over 50 adults with varying degrees of special needs and also runs a school for children with disabilities, a centre for up to 70 adults with disabilities, and a printing factory which employs a further 37 adults with disabilities. Furthermore InOut Hostel is a Green Hostel and uses BioMass energy for heating water so you are being kind to the environment.